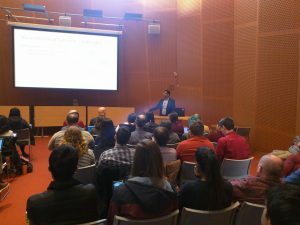 On February 14th, Arvind Narayanan visited IPRI from Princeton University, where he is an Assistant Professor of Computer Science and a key member of the team at the Center for Information Technology Policy (CITP). Among his many accomplishments, Professor Narayanan has changed the way we understand data privacy risk by reidentifying a series of purportedly anonymized datasets, exposed a breathtaking range of invasive web-tracking techniques, taught a generation of students about cryptocurrencies, and empirically analyzed bias in machine learning. Speaking personally, he inspired me to conduct research at the boundary of computer science and technology policy. His example and his mentorship are a large part of the reason I ended up pursuing a PhD. 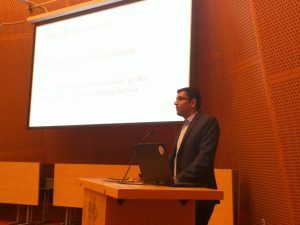 As he discussed during his talk, Professor Narayanan’s research on web tracking has refashioned the terms of debates over online privacy. His team continuously crawls the web in search of new trackers. By identifying these techniques and revealing them to website publishers, he has repeatedly exerted public pressure to compel advertisers to abandon privacy-invasive practices. His work has even driven browser manufacturers to take a stand against tracking, a development that would have been unthinkable a few years ago. His ongoing work on bias and fairness in machine learning has the potential to have a similar impact. By closely examining word embeddings, he has uncovered a visceral example of the way machine learning systems learn biases built into human language. During his talk, Professor Narayanan articulated the research philosophy that unifies these lines of work. He researches in policy-facing areas with complicated challenges that defy formalization and resist provably correct solutions, exactly the kinds of problems that make computer scientists most uncomfortable. These areas usually lack frameworks for characterizing the problems at play; he sees measurement as a first step toward understanding the nature of the underlying challenges. To leverage his findings to affect concrete change, he exploits existing incentive structures. Five years after first taking his class in information security at Princeton, I continue to look up to Professor Narayanan as a role model who applies his expertise in computer science to make progress on urgent socio-technical problems. I’m glad to say that, by virtue of his visit, my labmates now share this admiration.